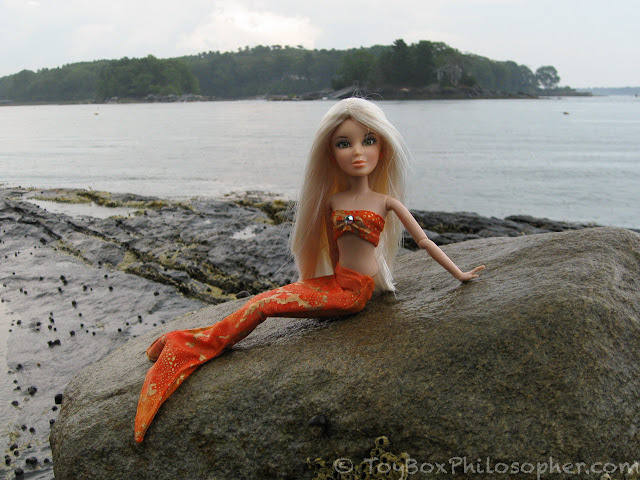 Barbie Becky "I'm the School Photographer" and Fin Fun Mermaid Tails--A Joint Review! I think this is surely the most unusual combination of reviews that I have ever posted together, but there's a neat connection--you'll see. First, I'm delighted to welcome my friend Feerie B. Wolfie from France who offered to review a rare wheelchair doll for the blog: Barbie's Becky, "I'm the School Photographer" (from 1998). 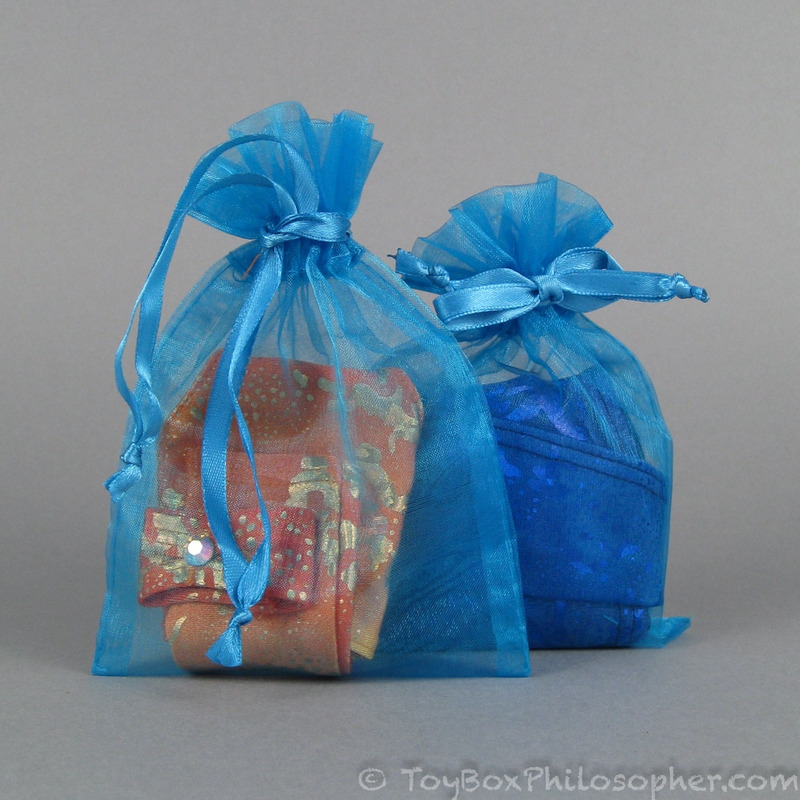 Feerie is a blogger, toy collector and doll customization artist. 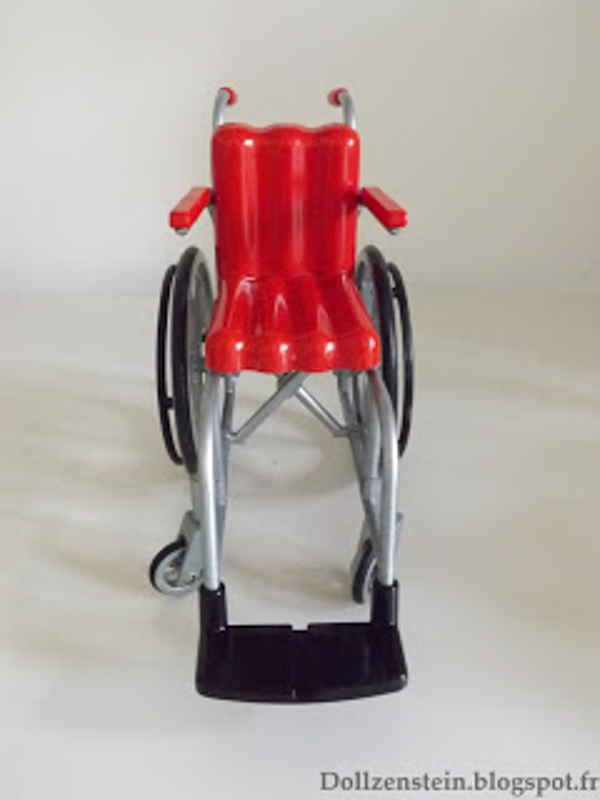 Her site (with the awesome name Dollzenstein) reviews old toys from her childhood. The blog is posted in both French and English, which is really helpful. 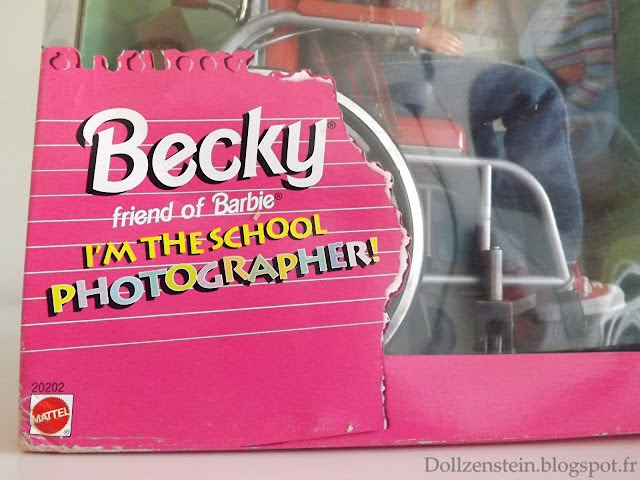 Barbie Becky "I'm the School Photographer," 1998. Now, here's Feerie with all of the details! 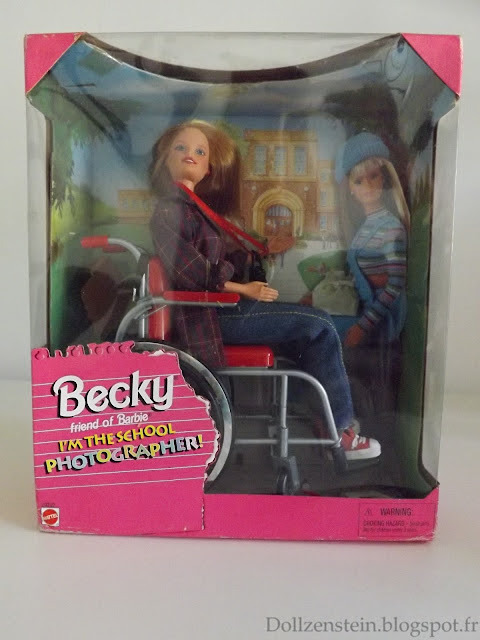 I bid welcome to the irony because I'm about to review the only toy in my collection that is not a childhood memory: "Share a Smile Becky," "I'm the School Photographer," or just "Wheelchair Barbie" as I tend to call it. I found her on the American eBay (I live in France). There must've been about 4 or 5 for sale, but only one could be shipped to my country. It cost about 45 US dollars (plus 20 dollars of shipping…). Concerning the box, we evidently get a big size (which is usually for playsets and princesses). And now for the back of the box. 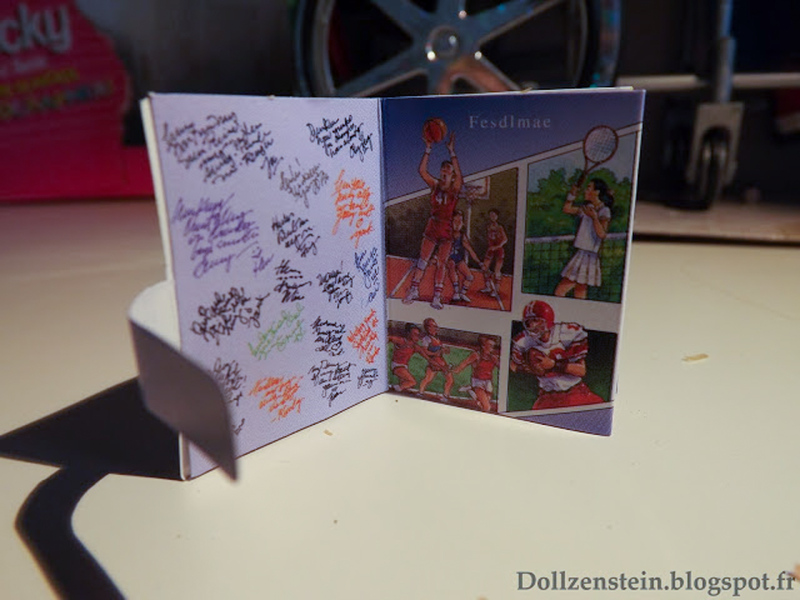 It has a photograph where we can see Becky and her pals outside their high school. Becky stands in the middle of the picture. Notice how Barbie is directly put in contact with her by giving a high five. All together, the girls form a friendly gang. Looks like a 10 years late Christmas gift. 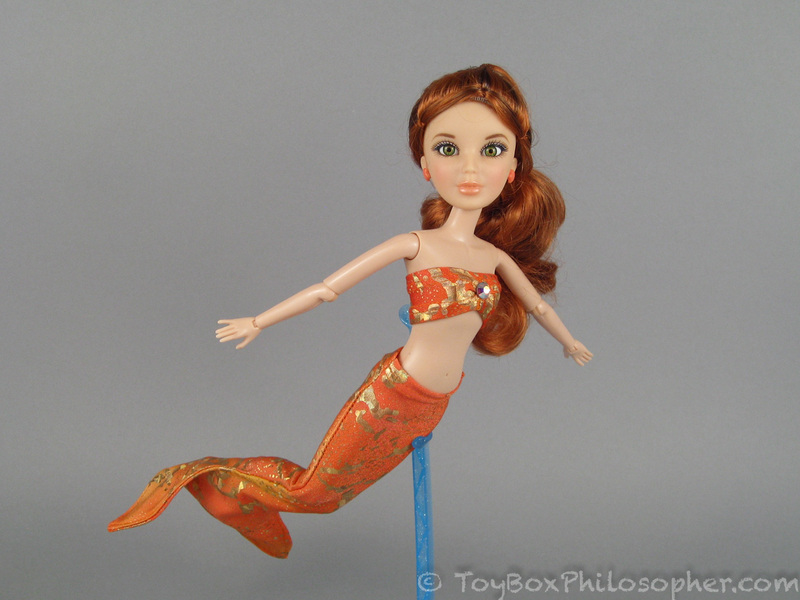 When I took Becky out, I was stunned to find out that her arms can bend. I wonder if the rest of the collection is the same? According to the 90's fashion, Becky wears a white T-shirt, jeans, red sneakers and a large lumberjack shirt. 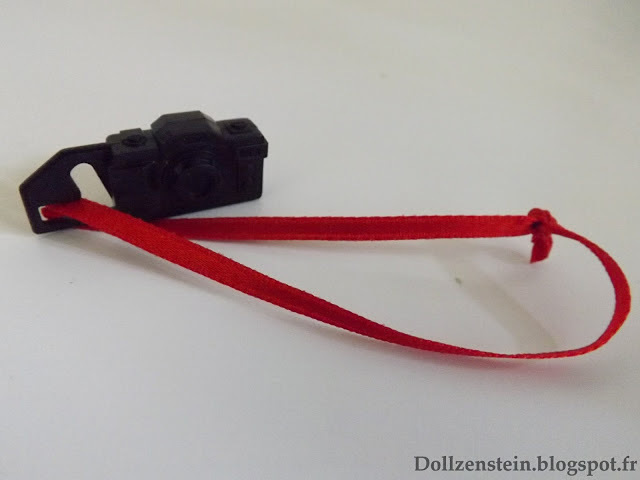 She wears her camera around her neck with a red ribbon. The camera is only modeled on the front. It has a hole to slide in Backy's hand. I thought it was gonna be easy, but I actually had a hard time finding the right way to position her hand. 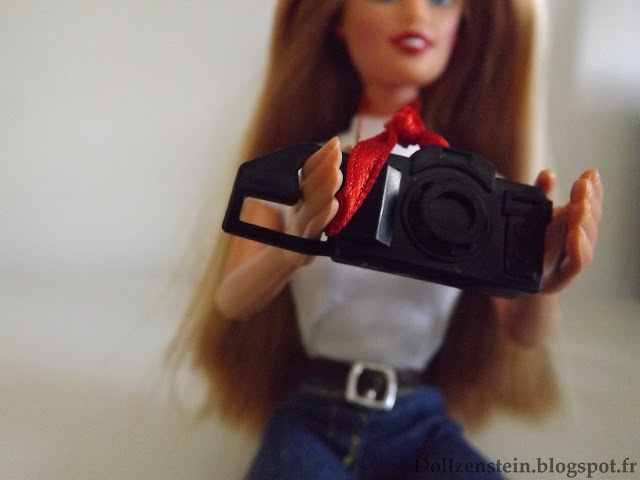 If you leave the ribbon around her neck while having her hold the camera, it outstretches the ribbon. 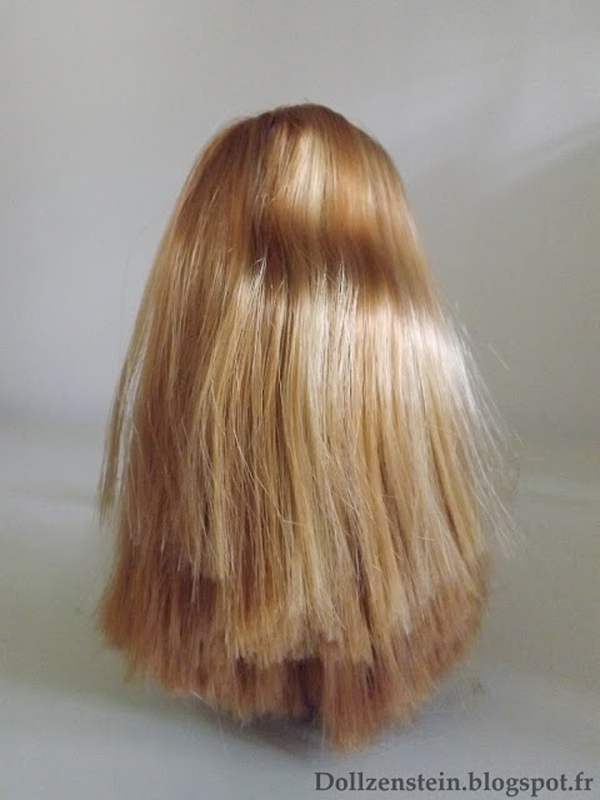 Becky can also brag about having soft and beautiful honey hair. It's not even all straight and rough and impossible to braid. (I think she's a size 5). The lumberjack shirt is well manufactured. Strings are pulled out a little bit around the edges of the sleeves, but it's not as bad as the T-shirt (that was not even stitched out entirely). 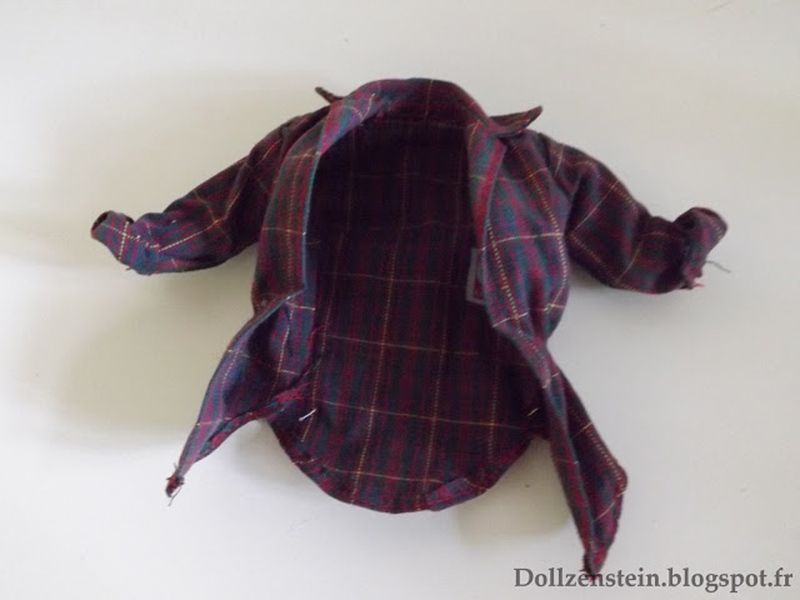 If you put the shirt on a Monster High doll, it looks like a man's shirt. The Tee is definitly less neat than the rest of the clothes for some reason. 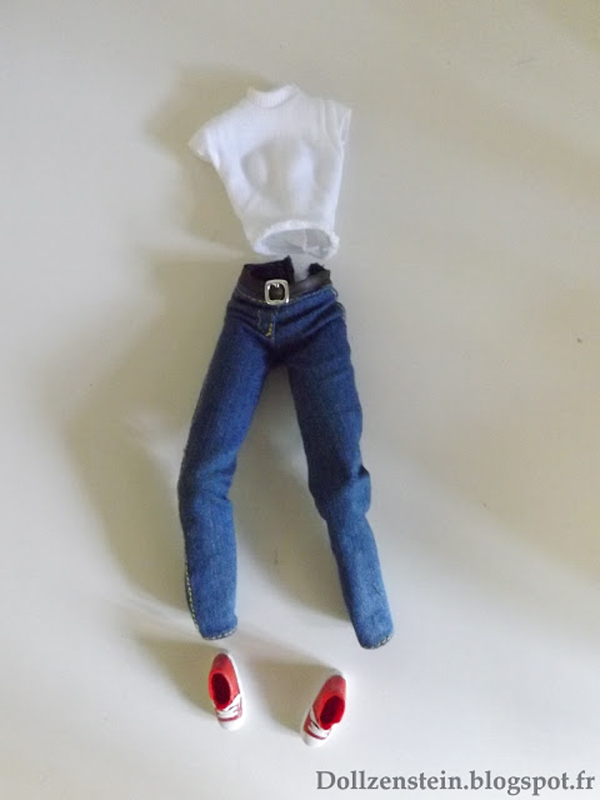 Notice how the pants stayed in the shape of the doll after remaining on her for so long. Wash your clothes after gym class, children! As an accessory, we get a simple pair of shades. They don't fit very well between Becky's hair bangs (although her hair is very well rooted, and I should know, I've been rerooting dolls for a while now). As the good student she is, Becky doesn't head off to school without a bag. Which sadly doesn't open. It would've been nice to carry stuff in there. Here's what Becky looks like in her chair. 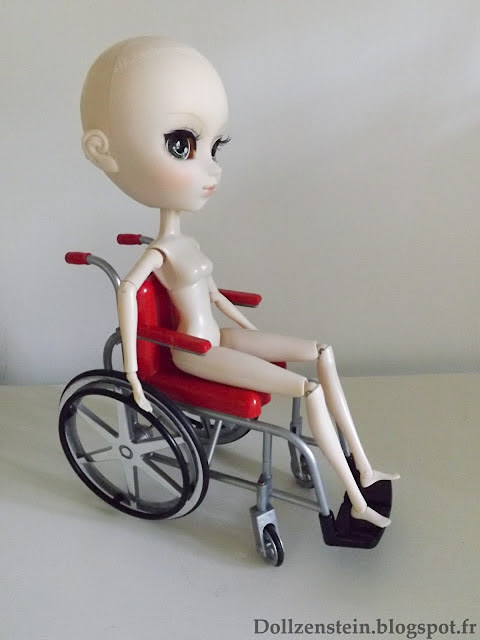 She sits perfectly in place, can't really use the arm rest but reaches the wheels, which will come in handy if she has to move by herself. 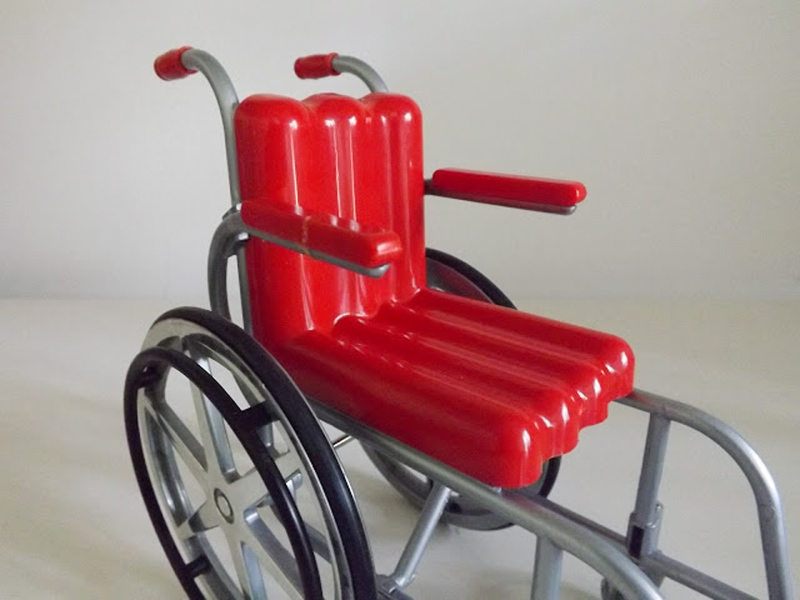 The chair rolls just fine. I said earlier that Becky is articuled. Turns out her arms AND legs are. Her upper torso can also turn. 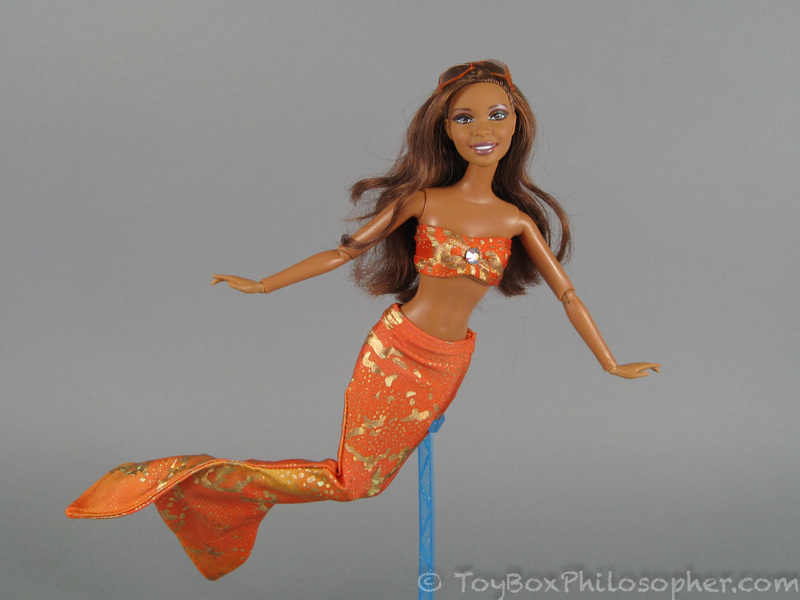 Apart from the upper torso, Becky has the same articulations as "Jumping Tawny Horse" Barbie. Notice that Tawny came out in 2007. The thighs are held in place by an elastic band, which allows a great flexibility. Before I give myself away to the wheelchair, I'm just going to show you the yearbook that comes with the doll, because it's neat. The book is remarkably detailed, you can tell they made a fine job of it just like the rest (except for that T-shirt). 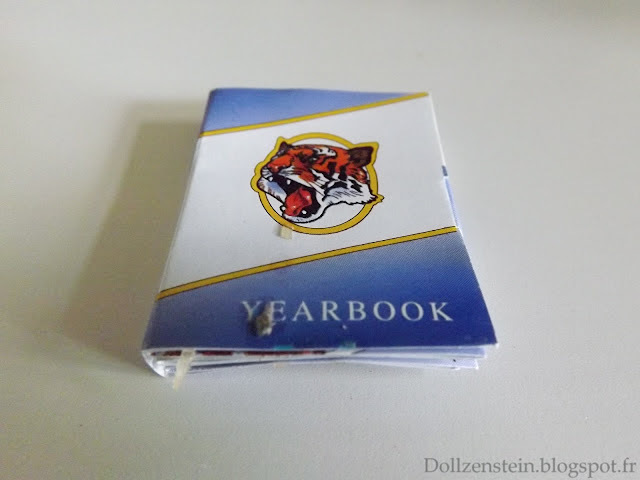 As a frenchie, I have no clue what a yearbook should look like. I'll leave that kind of evaluation to American people. Emily interrupts: as an American person, I can't read those headings! What language is the yearbook written in, I wonder? I can't zoom in on the signatures to get more information from those, either. I'd love to know if they're real sentences and, if so, what they say. So detailed! Good. 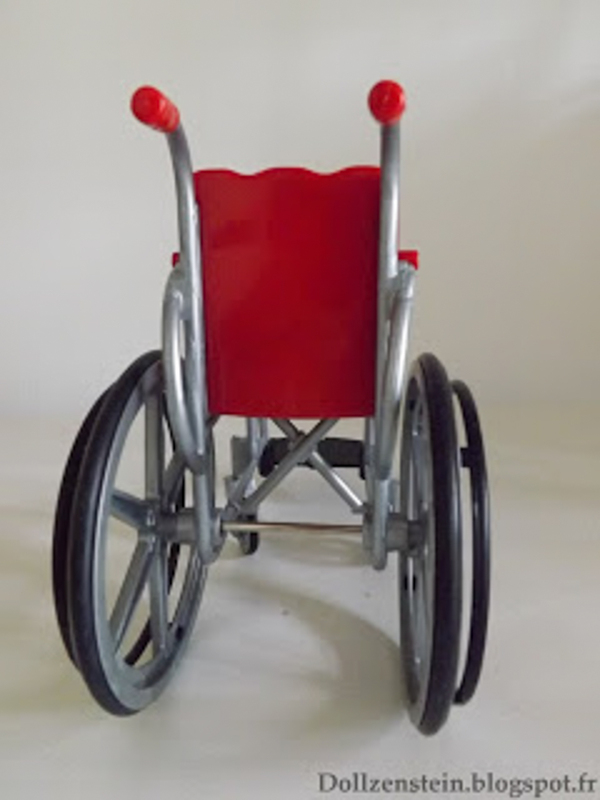 And now, onto what makes all the interest of this review: the wheelchair. Ironically enough, I really don't have much to say except that it's well manufactured. The big wheels shine when they spin, I think it gives a nice touch. Girly but not too girly. 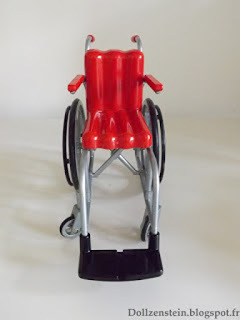 The previous wheelchair model that Mattel released had a pink seat. I find this one to be more realistic. 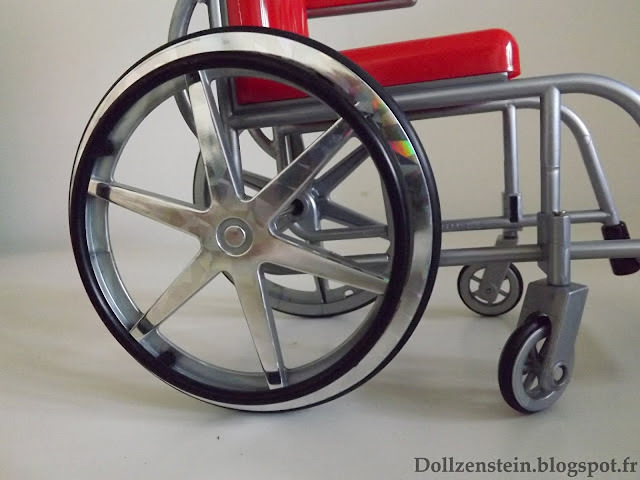 Don't freak out because the wheels look bent inwards, it's normal. 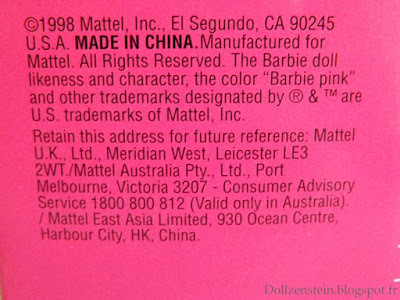 I guess Barbie dolls have thighs longer than the upper part of their body. Just look at the shape of that seat. 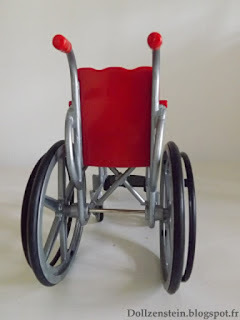 Real life wheelchairs seats have slightly different proportions. Then again, real life doesn't always meet the Barbie world standards. 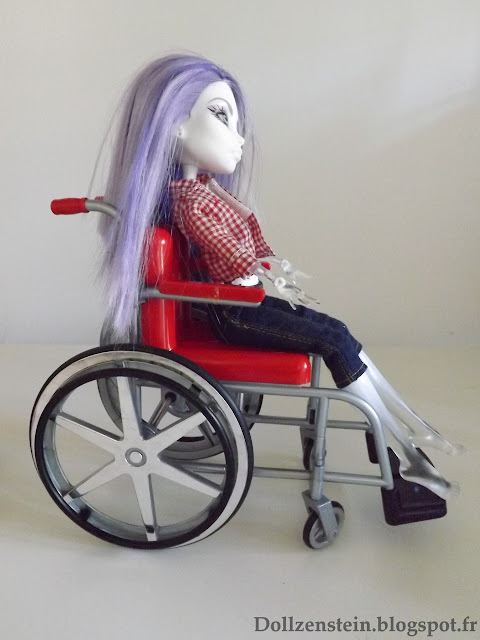 I don't own as many different types of dolls as the Toy Box Philosopher does, but at least I have some Monster High models to give you an idea of how another doll fits in the chair. It takes a bit of adjustment to make them sit right, but at least they can use the arm rest...more or less (short arms). I also have some Pullips. This one has a type four body, which is the most recent. 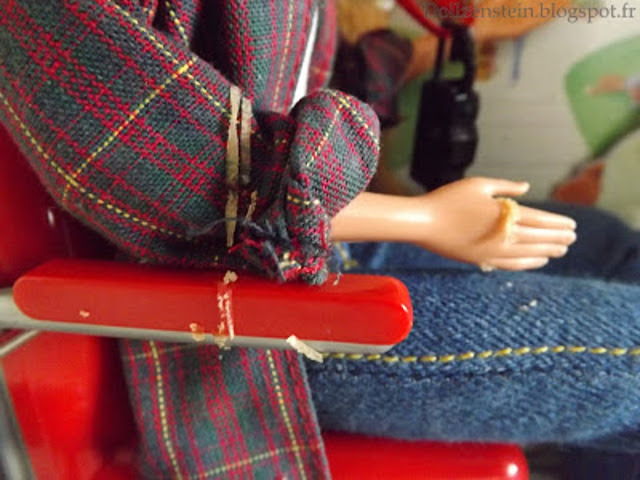 The doll doesn't sit well at all: she keeps on slipping out of the chair. Now that I think of it, maybe clothes would keep her body from sliding down. I've seen a Pullip sit in a Barbie wheelchair on Flickr once, and she was wearing a dress. “Representing the U.S.A. in a red, white and blue outfit, differently-abled Becky is an entrant for the Paralympic track and field event ("Paralympic" means next to or parallel to the Olympic Games). Becky has a racing-style wheelchair with an official Paralympic logo on the wheels and comes with helmet, gold medal, water bottle and towel. 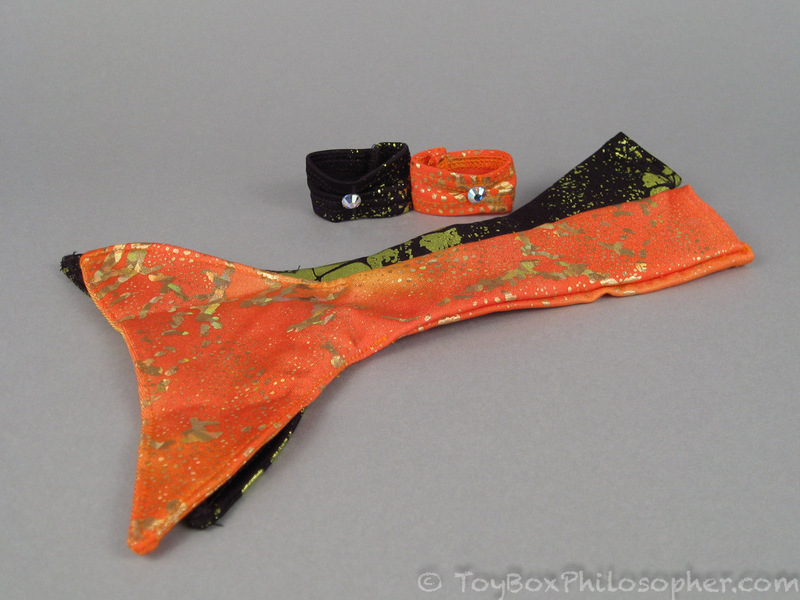 Using the accessories promotes fine motor skills. 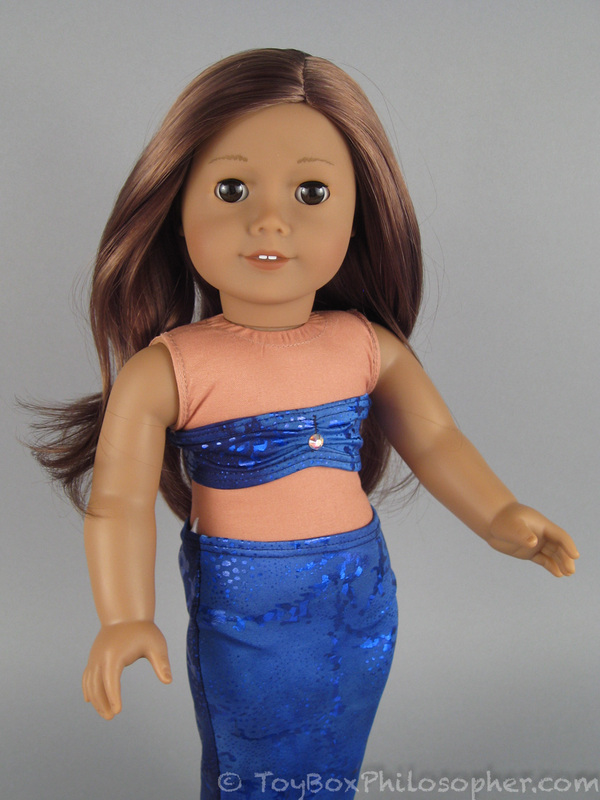 Role-play promotes character-building and interaction with other playmates and their Barbie toys enhance social skills. 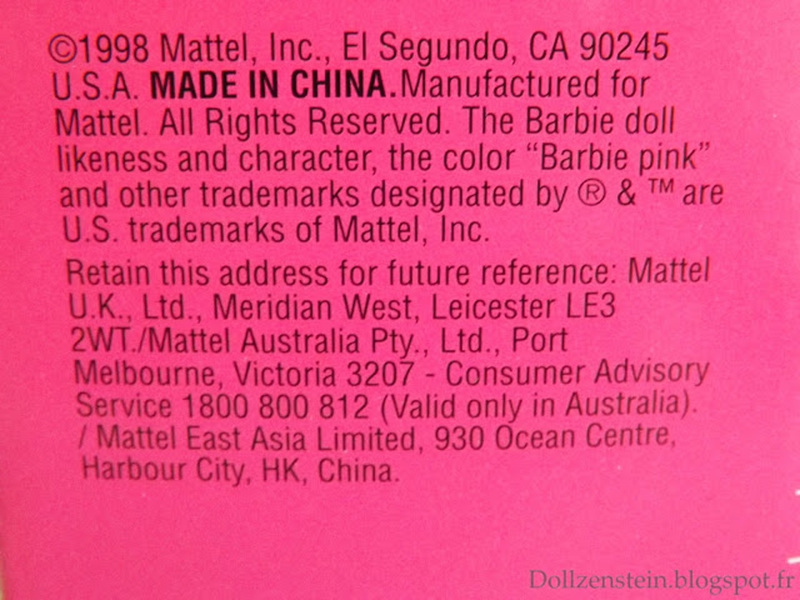 Doll measures 29 cm and can be used with all Barbie accessories.” (source: The Guide for Toys). And that's pretty much it. 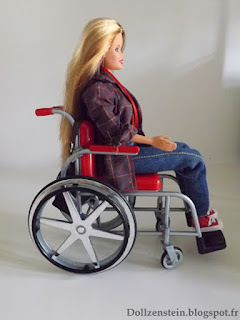 I really wanted to add those few informations for the one and good reason that Barbie wheelchairs are…again, not very common. I couldn't find a single review of the School Photograher. I think it's a pity that an item like this isn't widespread. 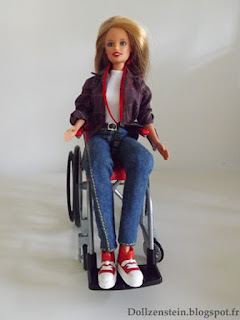 Barbie remains an icon that many children who have to live with disability or difference could identify with, as shown by Chemotherapy Barbie, or Ella, the Cancer Barbie. And I was hoping this review could help bring more doll wheelchairs in the future. Small world. I would like to thank the Toy Box Philosopher for letting me do this guest review, her blog is one of my favorites out there, and it makes me feel very happy to contribute in some way :) I'll also take this opportunity to let you know that if you're interested in 80's-90's toys reviews, I'm running a blog called "Dollzenstein" where I'll be taking a closer look at my own (large) collection. Thank you so much Feerie! I find it brilliant that Mattel would use a merman character to incorporate a wheelchair into the Monster High brand. So clever and fun. And now you see the connection to mermaids in this joint review! 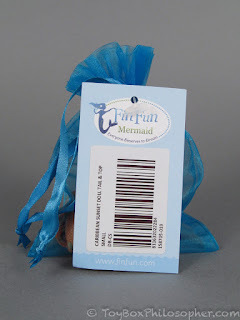 I've actually had a few Fin Fun mermaid tails since last winter when Arieta kindly emailed to suggest I take a look at them. These doll fins are very simple, so they don't really need their own stand-alone review. I've been hoping to find the right moment to attach them to another relevant post...and I've finally found the perfect moment! Two of my doll fin sets came in attractive little tagged cloth bags and the other one came in a regular plastic sandwich bag. 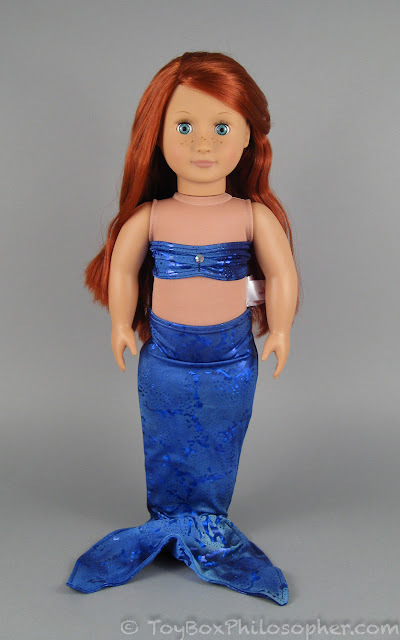 The Barbie-sized fins cost $9.95 and the American Girl fins cost $12.95. 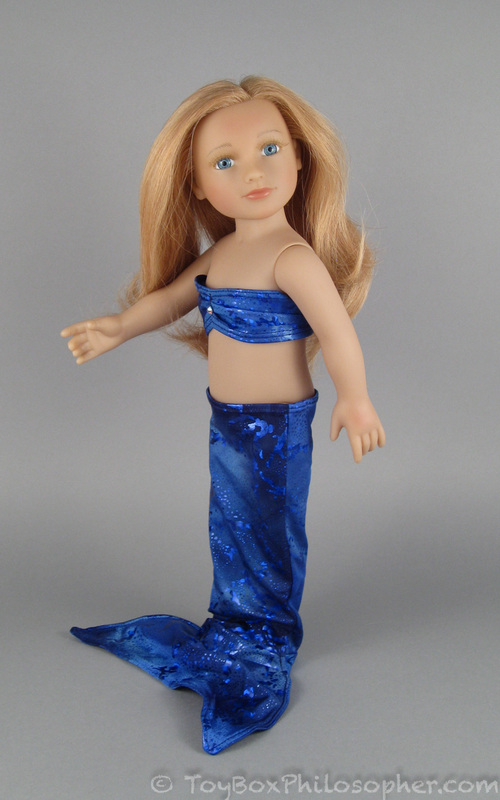 The Fin Fun company also makes human-sized mermaid (and merman) tails, which is actually their primary business. 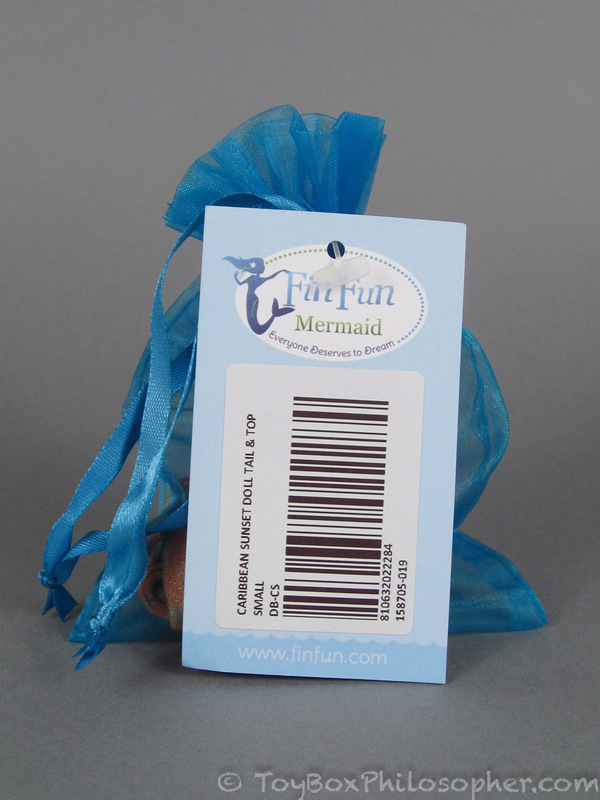 These tails cost about $60 and can actually be used for swimming. The life-sized tails are fascinating (and apparently safe) and are definitely worth looking at--even if you have no interest in buying such a thing. 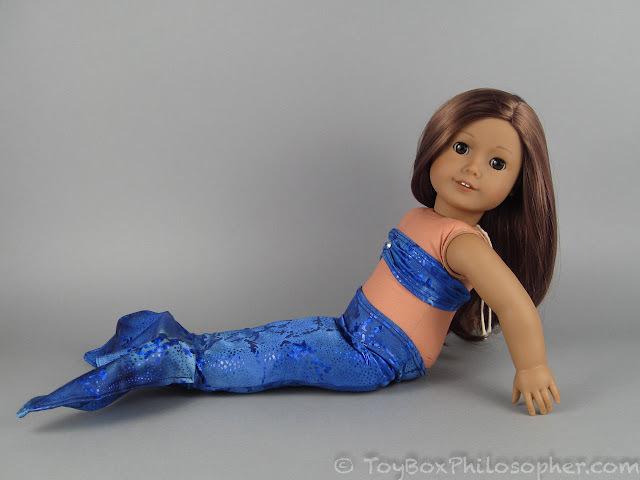 I would never attempt to swim wearing a mermaid tail, but the kids in the instructional videos make it look really fun and athletic. It's also quite beautiful to watch people swim like mermaids. 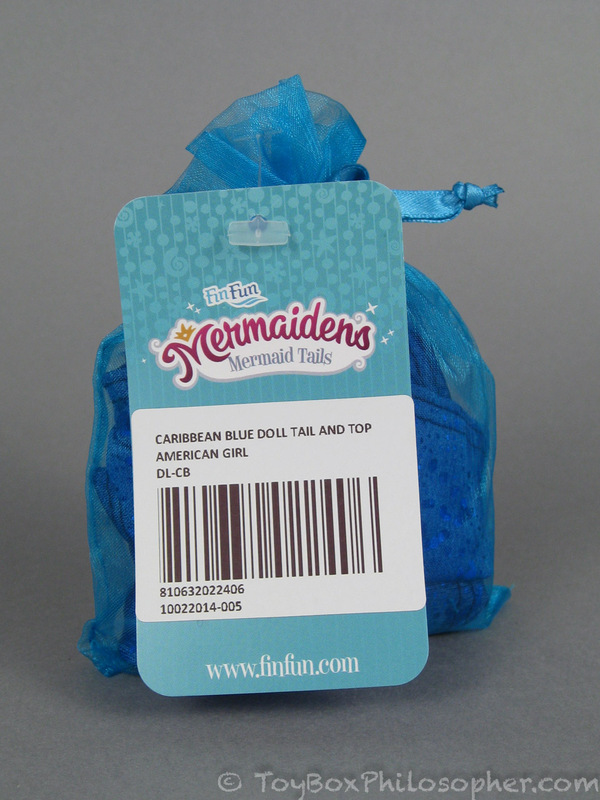 The American Girl fin set is labeled "Mermaidens," and the Barbie-sized tail is labeled "Fin Fun Mermaid." 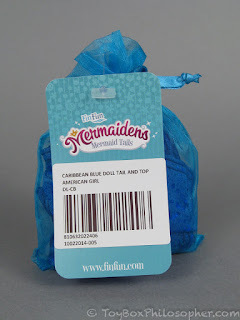 My guess is that the Mermaidens label is slightly newer. The Fin Fun company has a blog site with an extensive series of story installments based on seven Mermaiden characters. 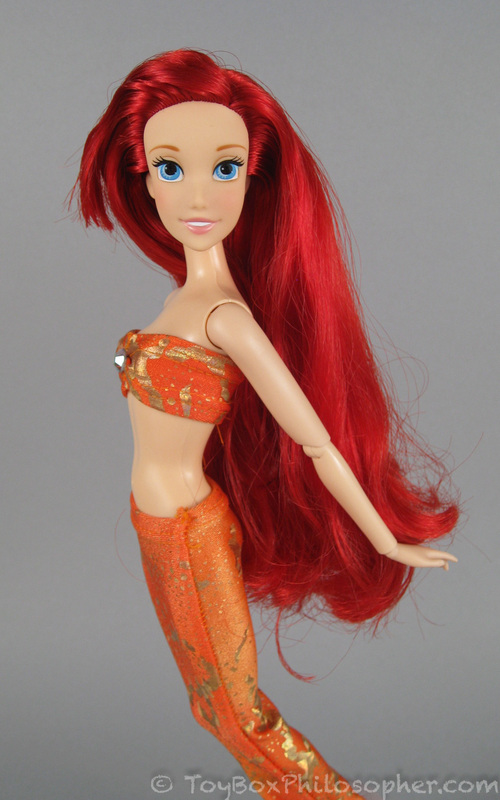 For example, the red-haired Brynn is a Mermaiden from the North Atlantic and she has the power to create light. In the Fin Fun shop, there are some items specific to Brynn's color scheme and story--like Brynn's Celtic Green Mermaid Tail. None of the fins I bought seem to be associated with a specific character. This particular color does not seem to be available anymore. 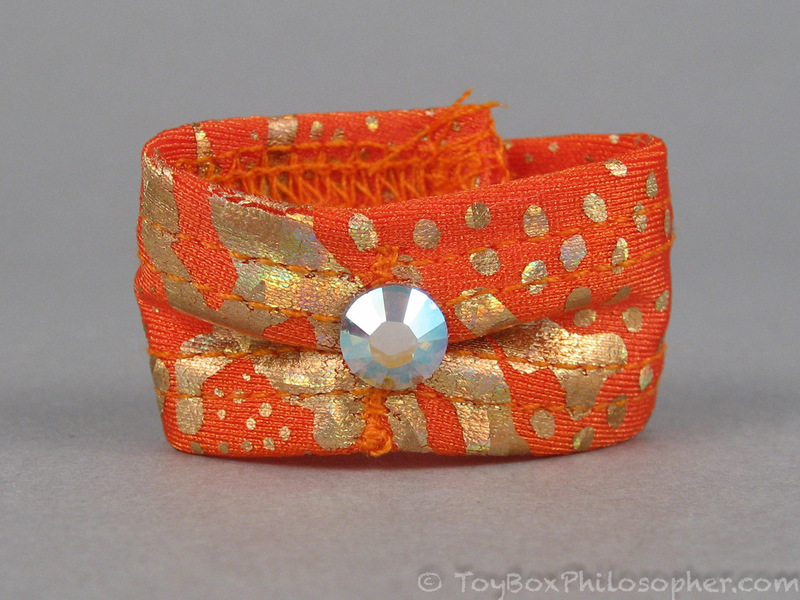 These pieces are small, but they feel very sturdy and well-stitched. 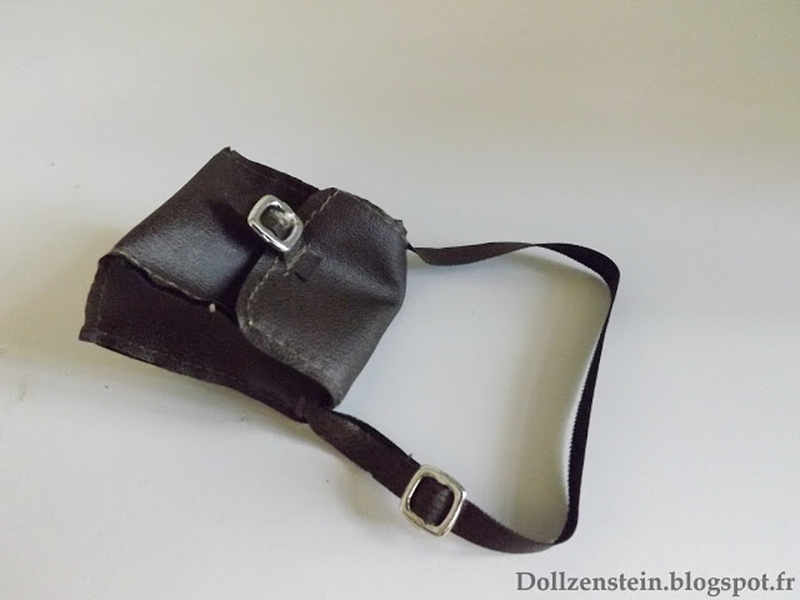 I suppose this kind of thing would be easy to make for those who are experienced with sewing machines and stretchy fabrics. I'd love to hear opinions from any seamstresses out there. 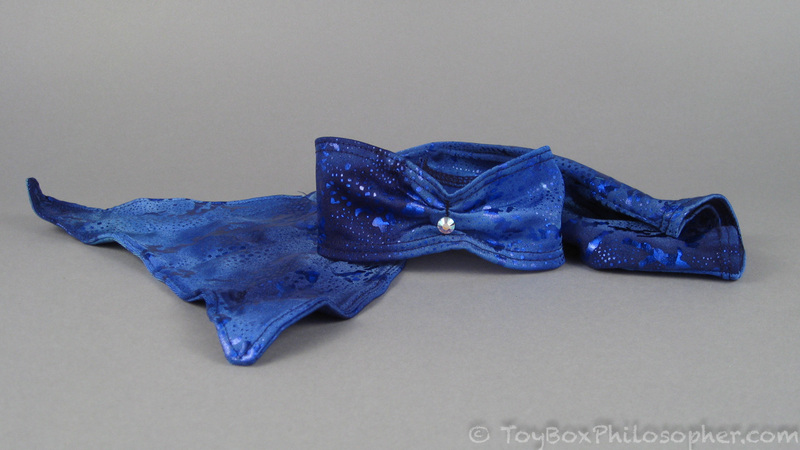 In particular, what do you think of the $10 price for this kind of item? 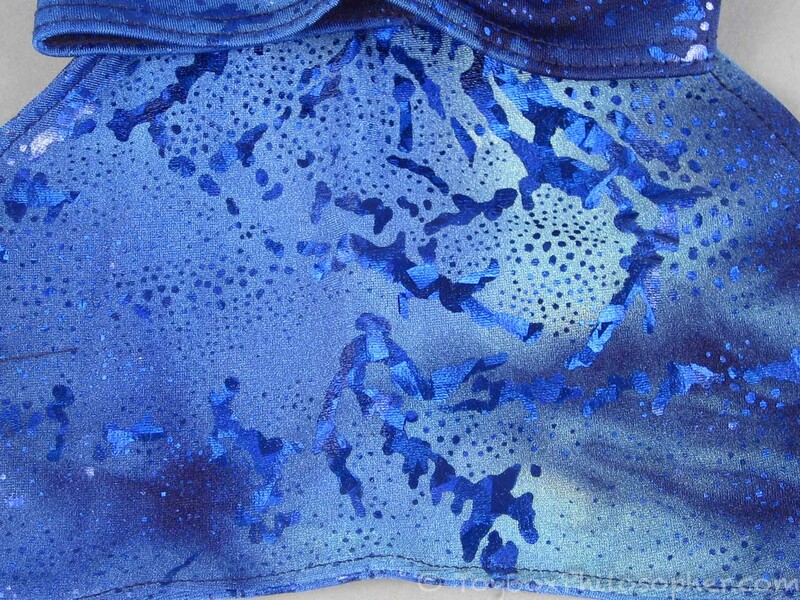 I have very little sewing skill, so I'm delighted to pay $10 for someone else to find beautiful fabrics and sew such a creative little set for me. Liv Hayden wearing a Fin Fun mermaid tail. Hayden's waist joint is especially good in combination with the tail. The fins are very easy to get on and off and they stay on well. It's amazing how this little $10 set can quickly transform Hayden into a beautiful sea creature! 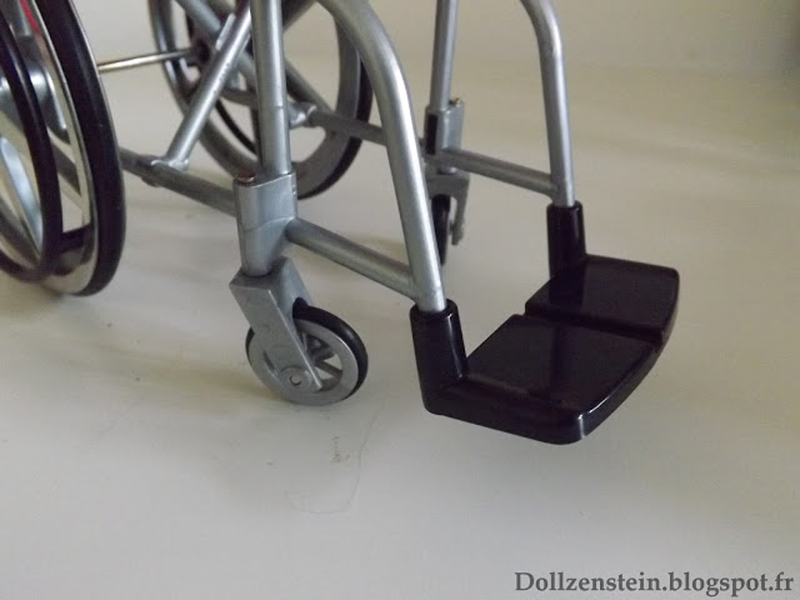 As an aside, I found the doll stand from Beatrix Girls Lark to be incredibly helpful in this review. As another aide, I've heard that the new Barbie Style dolls with articulated ankles do not have this torso joint. Boo. 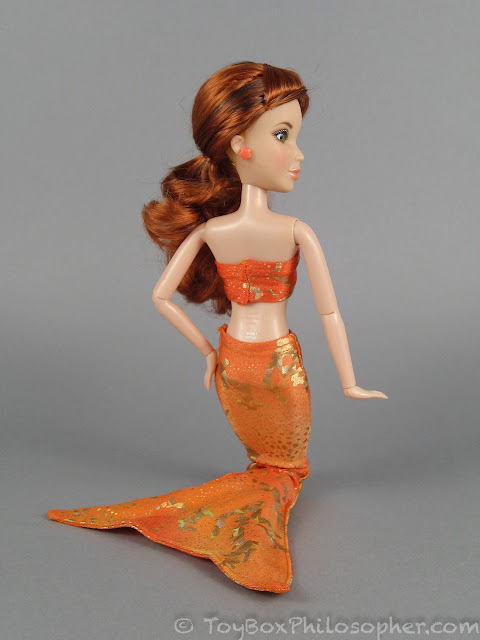 Barbie wearing a Fin Fun mermaid tail. 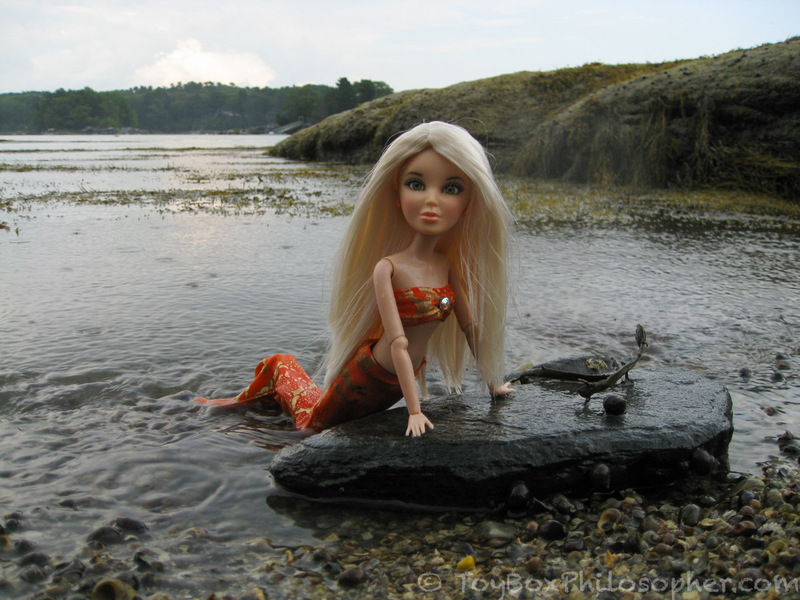 She isn't articulated enough to strike many interesting poses...but I think Bryden was meant to be a mermaid! Although the Disney Store dolls with internal knee joints are not ideal for these fins because it's difficult to pull the stretchy fabric over rubbery legs. 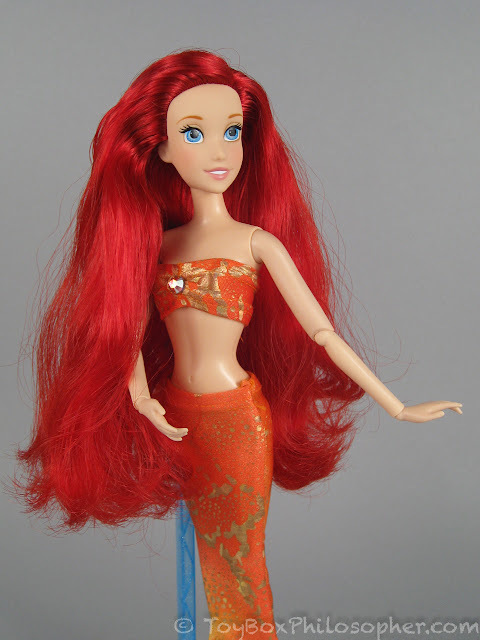 The Disney Store's Ariel wearing a Fin Fun mermaid tail. 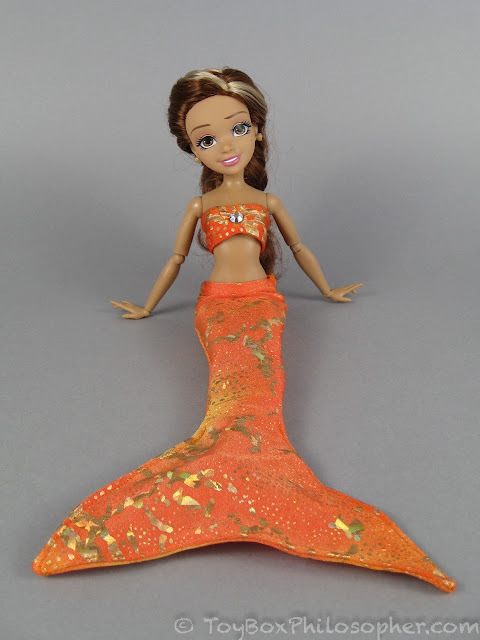 Disney Descendants Audrey wearing a Fin Fun mermaid tail. I even tried the fins on my Once Upon a Zombie Belle (in honor of the new dolls that are coming out...) with surprisingly good results! And the top slips down way too easily. I was pretty bummed about this because I'd planned to have a permanent Liv mermaid on display. I paid the same price for both of the small sets, and I don't remember there being any note about this particular set being defective or on any kind of clearance. Hopefully, the ill fit is an isolated incident. 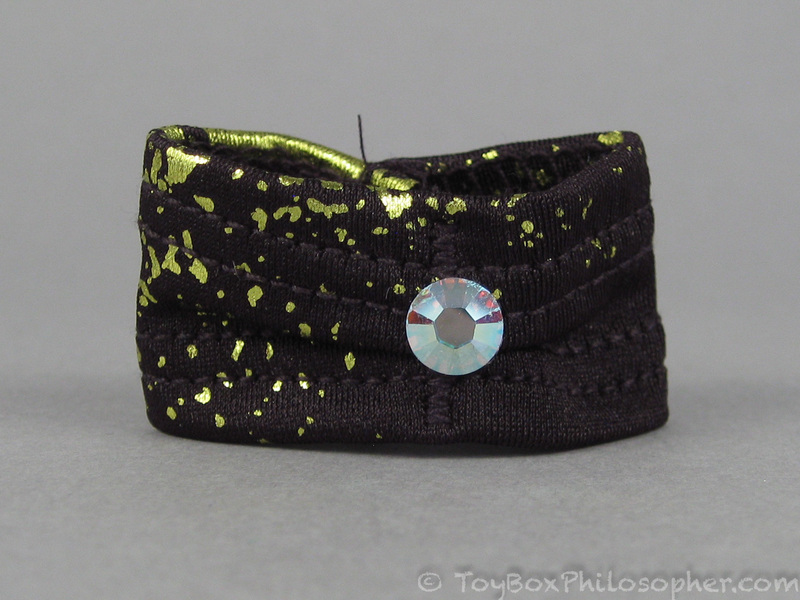 The bandeau top has a rhinestone accent and a small line of stitching that indicates the top (or the bottom?) 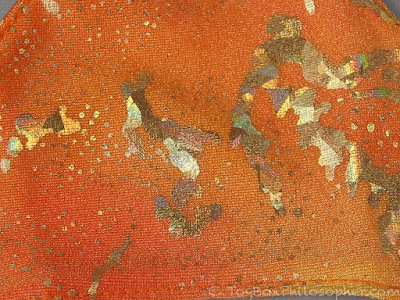 of the piece--not sure. 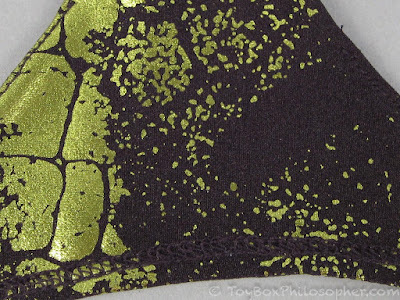 I found that this bandeau can be used either way, but usually looked best if the stitches were at the top. Which makes this picture upside-down. 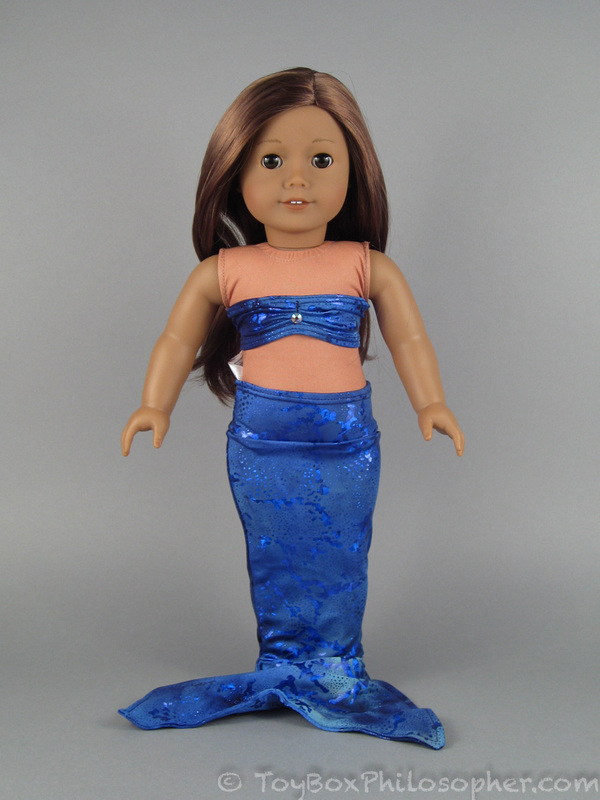 American Girl doll wearing a Fin Fun mermaid tail. American Girl dolls don't have much articulation to begin with, and the tail just removes their ability to stand solidly and sit well. 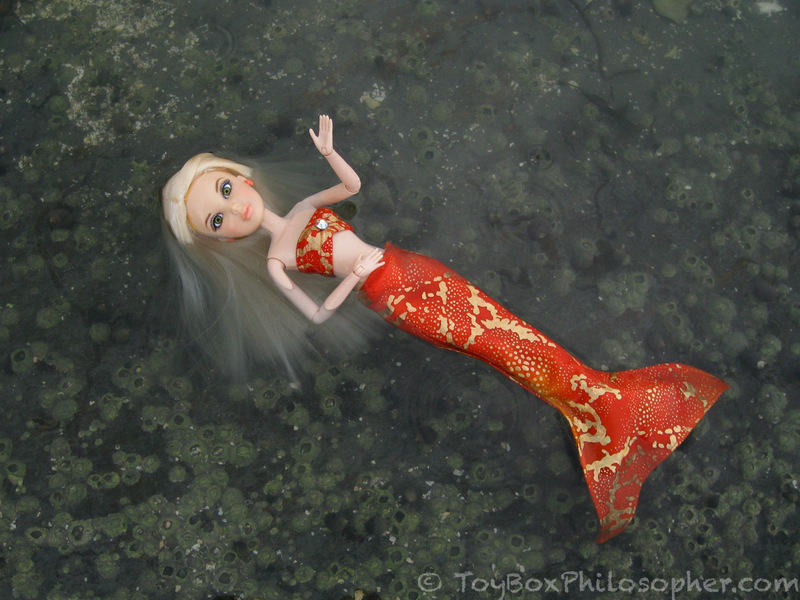 Also, I don't recommend getting a cloth-bodied doll anywhere near the water...which takes some of the fun out of owning a waterproof fin set. 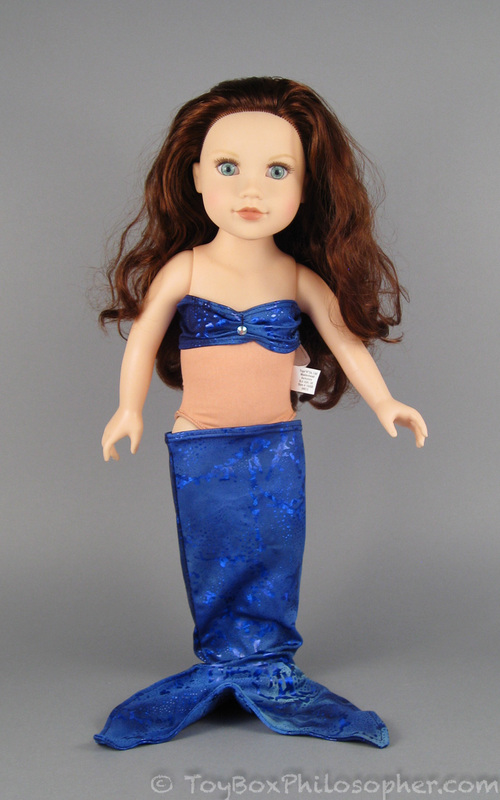 My Life As doll wearing a Fin Fun mermaid tail. Fin Fun tails are too big for Journey Girls. 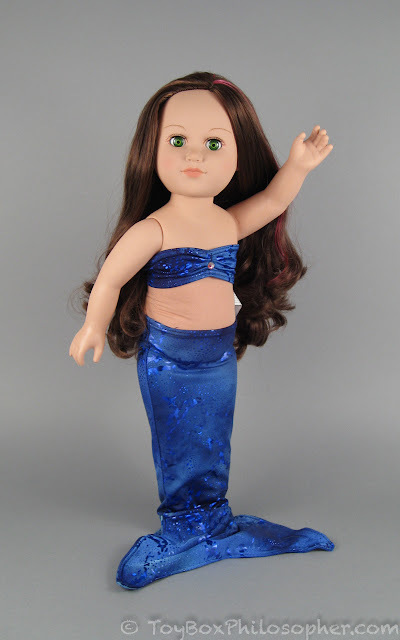 I was hoping that the tail would fit some of my slimmer, all-vinyl 18-inch dolls like Carpetina, Kidz 'n' Cats or My Salon Doll--especially the My Salon Dolls, since they're designed to be put into the water (although I don't actually recommend doing this). Fin Fun tails are also too big for My Salon Doll and other slim 18-inch dolls. Our Generation doll wearing a Fin Fun mermaid tail. 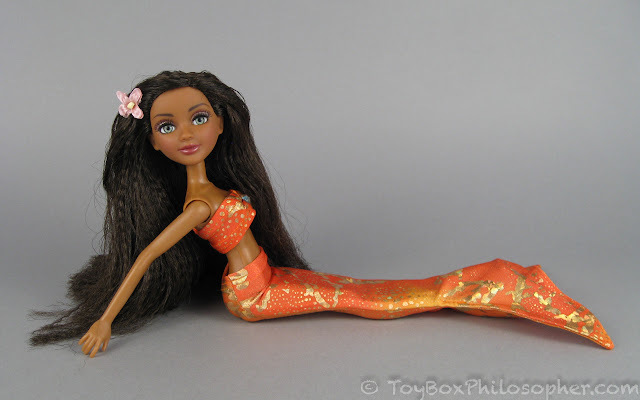 I was thinking that the mermaid theme would be especially good for some of the really long-haired Our Generation dolls like "From Hair to There" Peyton. 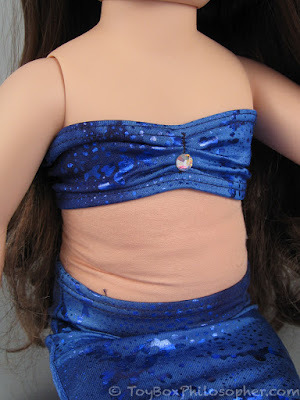 But, again, I find the capsule-shaped cloth torso too much of a distraction with this style of doll. Poor Maia's white torso really doesn't work with the bandeau top, though. She is also a little shorter through the body than Our Generation and American Girl dolls, so the fit of the bandeau is scrunched. I wanted to get one of these mermaid dolls to the beach to really test out the fins. I decided to take Liv Hayden, because she looks amazing in the fins, and also because her wig is removable and can be dried separately. For this outing I chose a very pale blonde wig that is a little lower in quality than most Liv wigs (so I didn't mind getting it wet). The wig also reminds me of Daryl Hannah in the 80s movie, Splash. Both Hayden and the fin set stood up well to water play. Neither the tail nor the bandeau top fell off in the water. Bottom line? 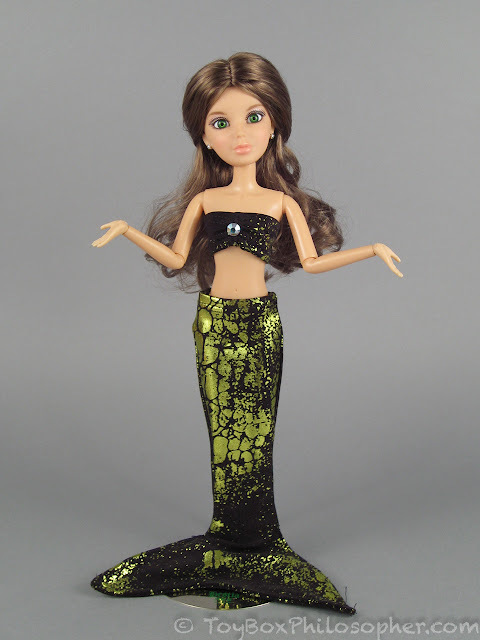 I think these simple, affordable Fin Fun sets are nice for quickly transforming any kind of doll into a mermaid. 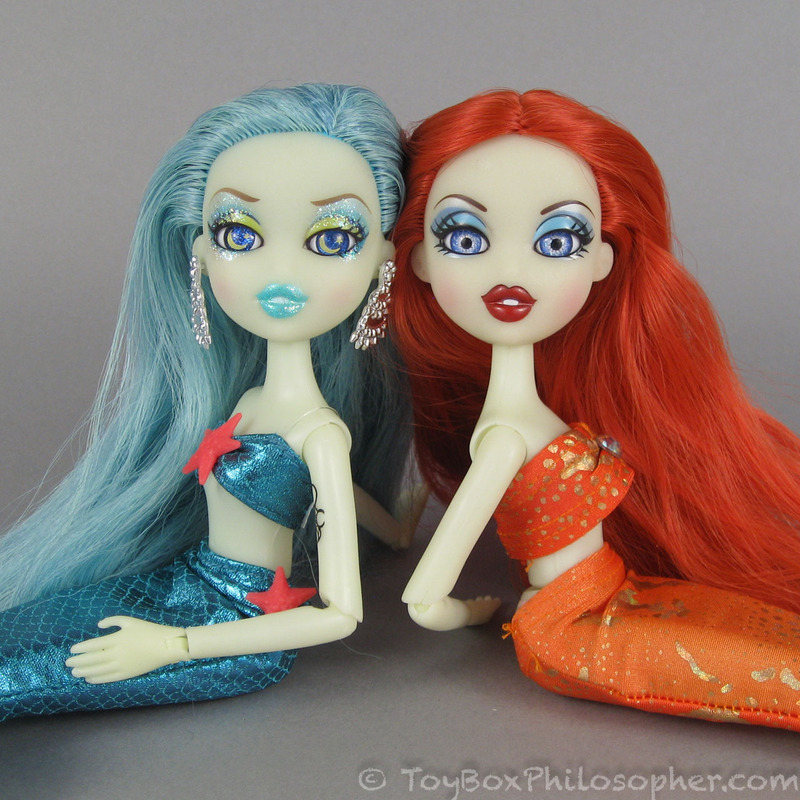 I think the sets are particularly outstanding for smaller all-plastic or all-vinyl articulated play dolls like Barbie and Liv. I enjoyed watching my 10-12 inch dolls discover their inner mermaid--some of them revealing a very different look or personality. I also had a wonderful time photographing Hayden at the beach. 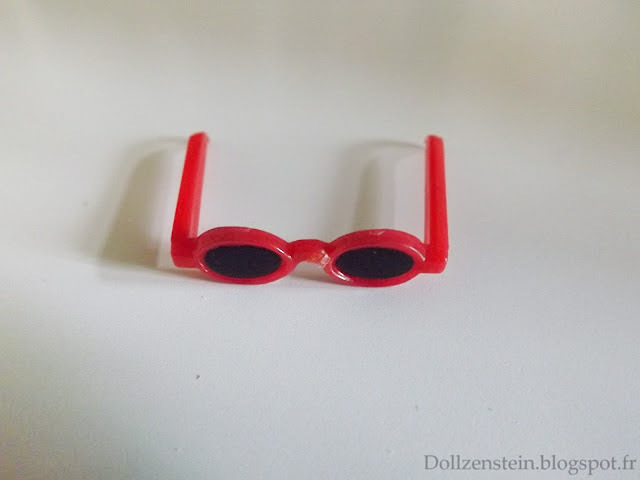 There are a lot of different ways that creative kids could incorporate these fin sets into their imaginary games--or even into their bath time or beach vacations. $10 seems like a small price to pay to give a beloved older doll a beautiful new, water-friendly fantasy look. Oh, this was such a great review! 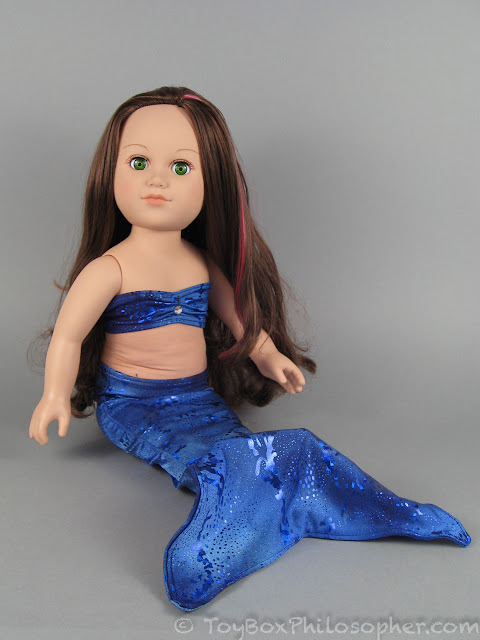 It combines two things I love: inclusion of differently-abled dolls, and mermaids! :D This was such a wonderful review, you two! Thank you so much for sharing! 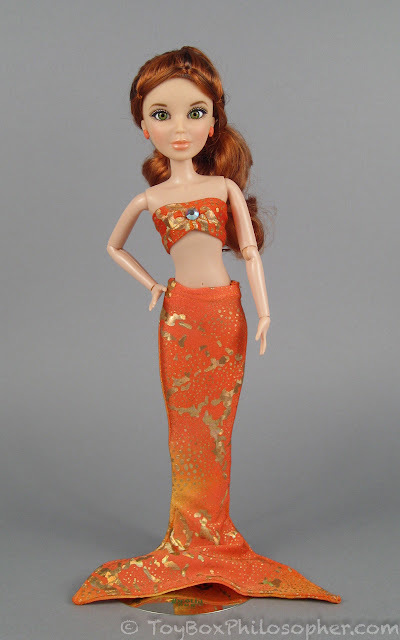 I have a Barbie with the same body as Becky. 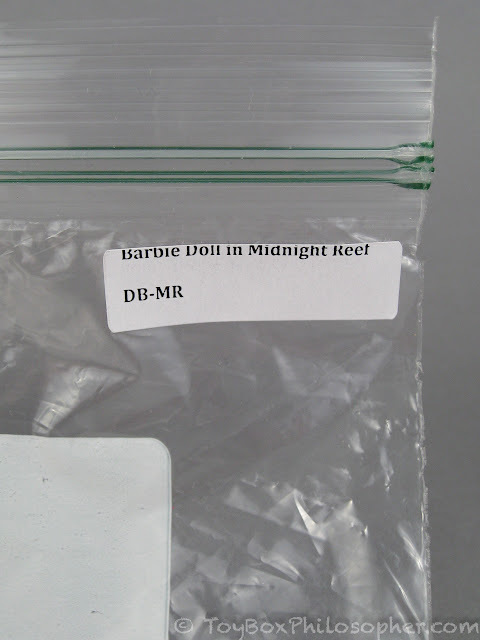 As far as I know, it's been used for 'action' Barbies beginning 1993. Now I wonder what body Becky would have if Mattel re-introduced her. One of the Fashionistas, maybe? 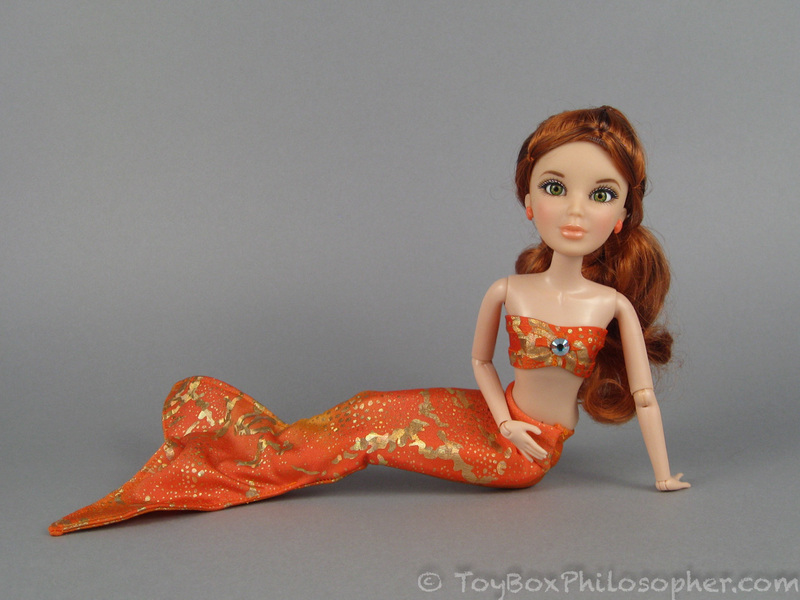 I think $10 is a good price for the doll sized top and fins. It would be a snap for an experienced seamstress to make, but there's a lot to factor in the cost from an actual company. I would contact them about the black and gold outfit that doesn't fit. At that small size, even being a bit off in the seaming can have big consequences. I'd say it's just a sewing error that went unnoticed. Becky! 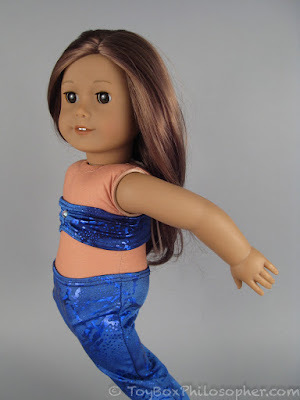 I have an old Barbie book that I had been reading to the girls with this character in it so it's so interesting to see they made a doll version of her. My 6 year old discovered these "life-sized" Fin Fun mermaid tails from a YouTube video and has been telling me all about them. I am really surprised to see they make doll versions. 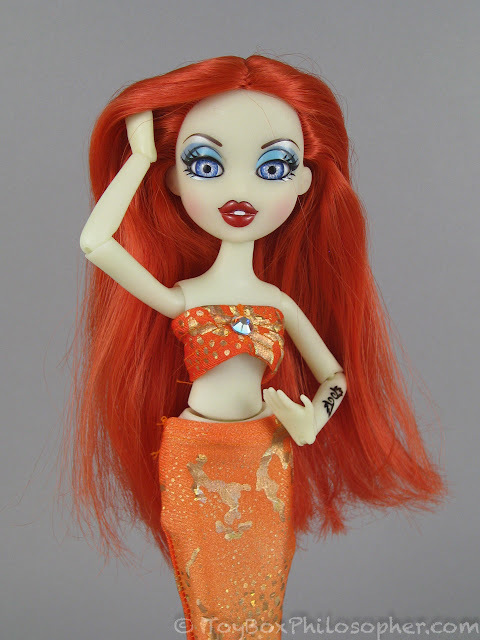 I like the 12 inch doll version much better, though. Personally, for me, I just don't think they quite work for the 18 inch dolls. It's great to see Hayden back in action though, I love the Liv gals! I had a Becky when I was a kid, that same one too! 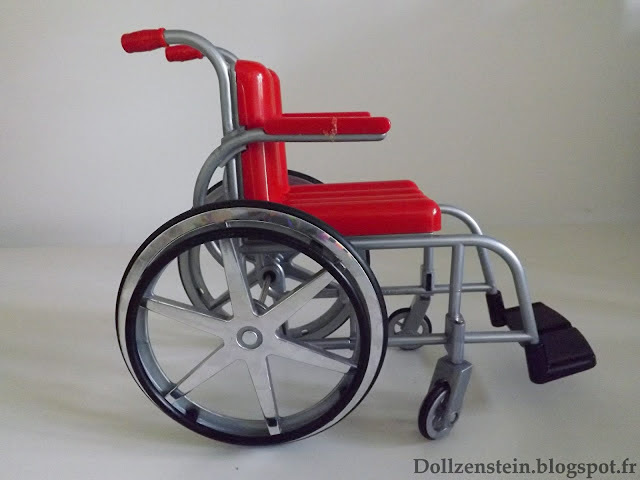 Sadly her wheel chair broke fairly easily under play conditions. 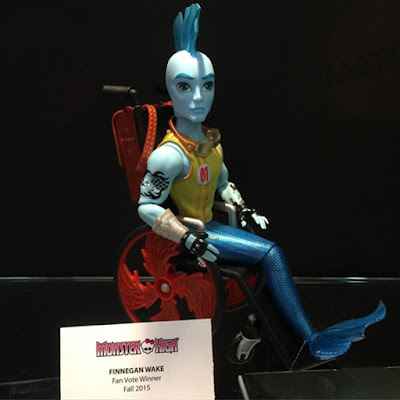 I hope the upcoming Finnegan from Monster High has a sturdier one; I'm really looking forward to him. Great reviews! I bought this wheelchair a year or so ago to add some diversity to my doll crowd and it is definitely cute but some of the plastic is super weak! It actually arrived to me with both arms broken clean off at the grey part which sucked. It superglued back on easily enough but it was kind of a pain. I don't know if that can be put down to rough shipping or whether it's the fault of the manufacturer! But I do love it overall. Thanks for both reviews. 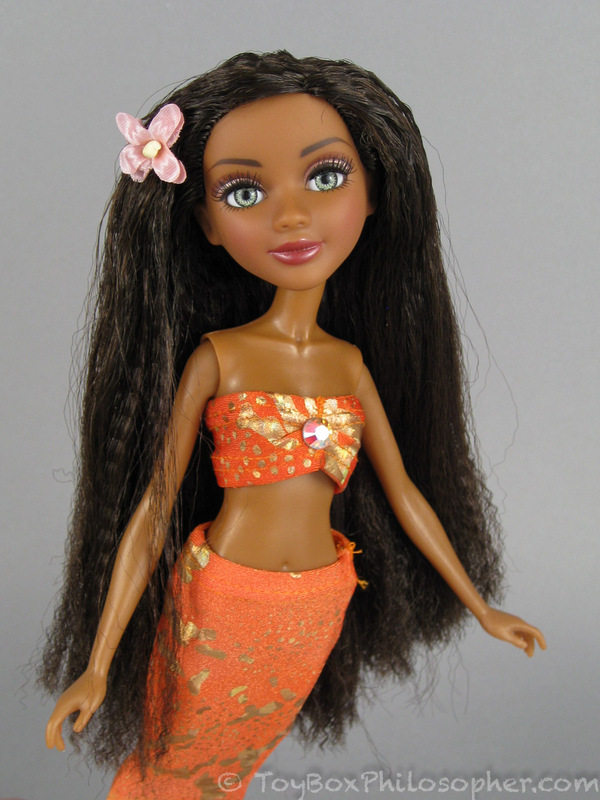 I too hope that more diverse dolls get made by mainstream manufacturers like Mattel. 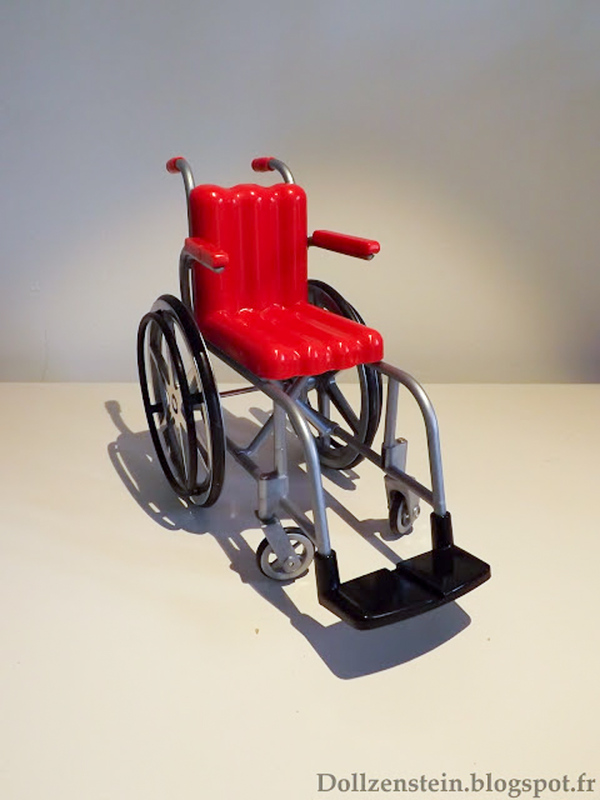 Not only are there adults with wheelchairs but many children are, some temporarily but others for the rest of their lives. 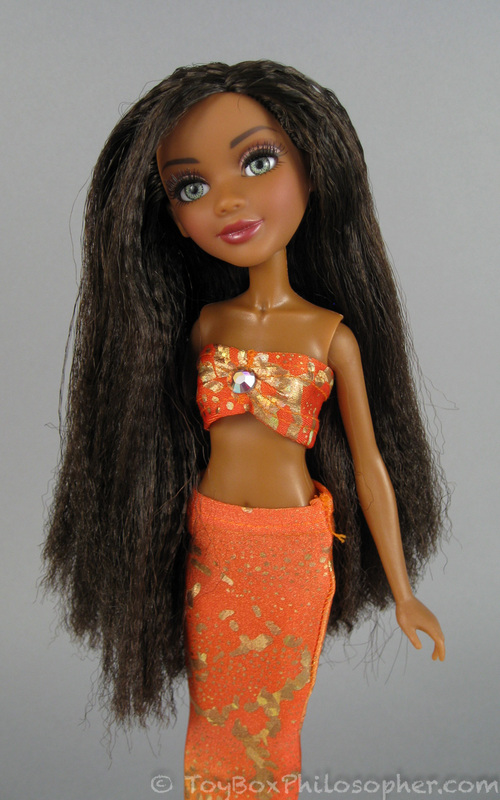 I'd like it if they made a Barbie like Delilah on NCIS. Barbies and Kens with prosthetic limbs would be inspiring (and accurate) especially if they create military dolls again. 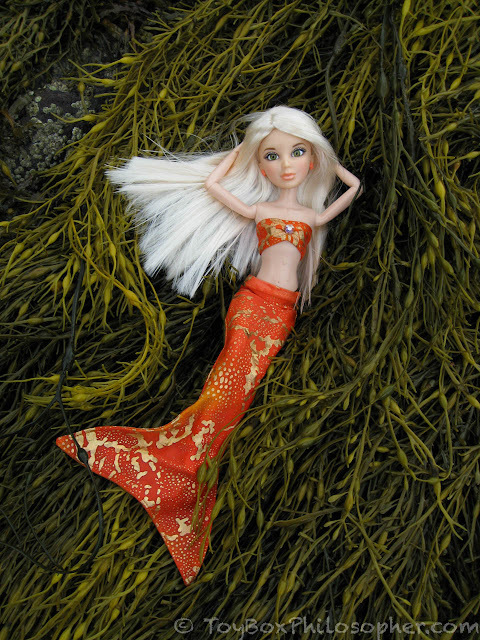 The mermaid tales are very cute. This is a trend that's not going away. 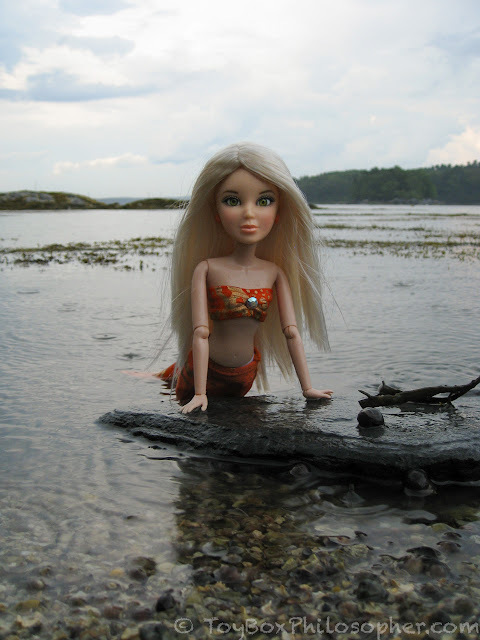 I know adults and children who took mermaid swimming lessons this summer. 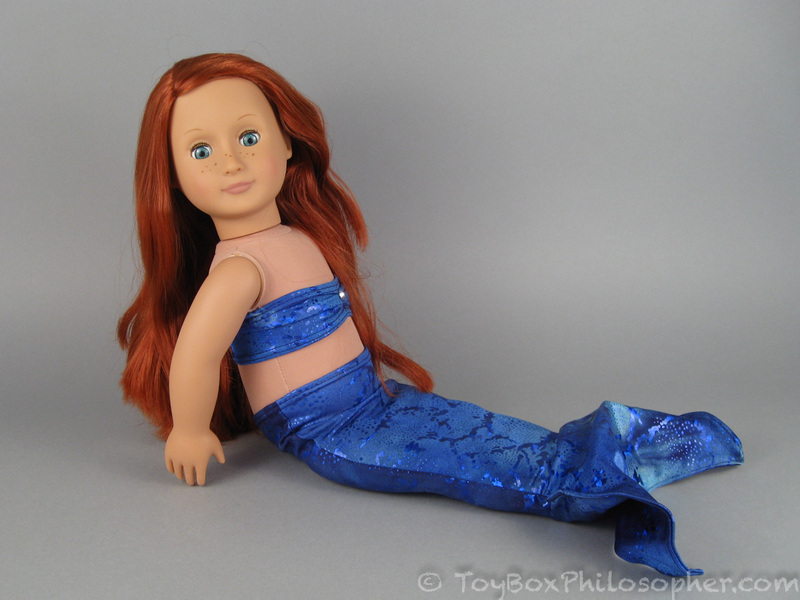 I wonder how the bigger one would look on a Disney toddler since they have a more realistic plastic torso. You may have to run a bit of narrow elastic at the waist if you don't want it sliding down. 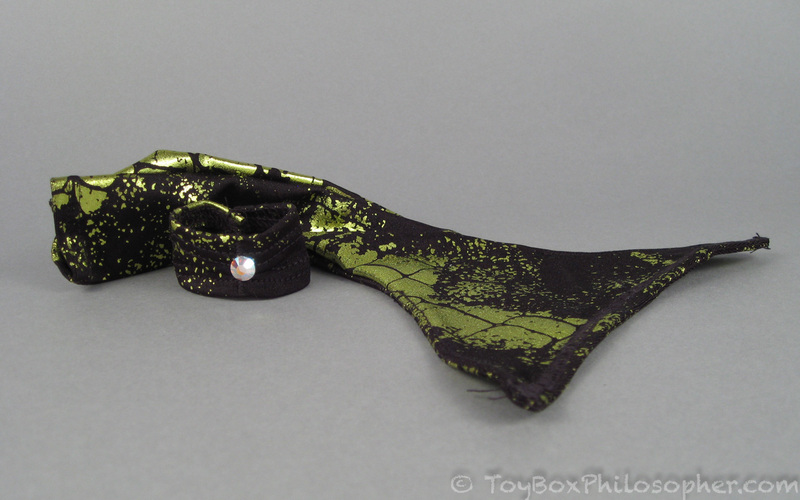 Sometimes just a one inch section of elastic at the side seams will pucker the fabric just enough to get a better fit. The prices are reasonable: there may only be a small cost in fabric but cutting, sewing and a bit of pressing would make this take up to half a hour to finish. Love both reviews! The yearbook is really funny. 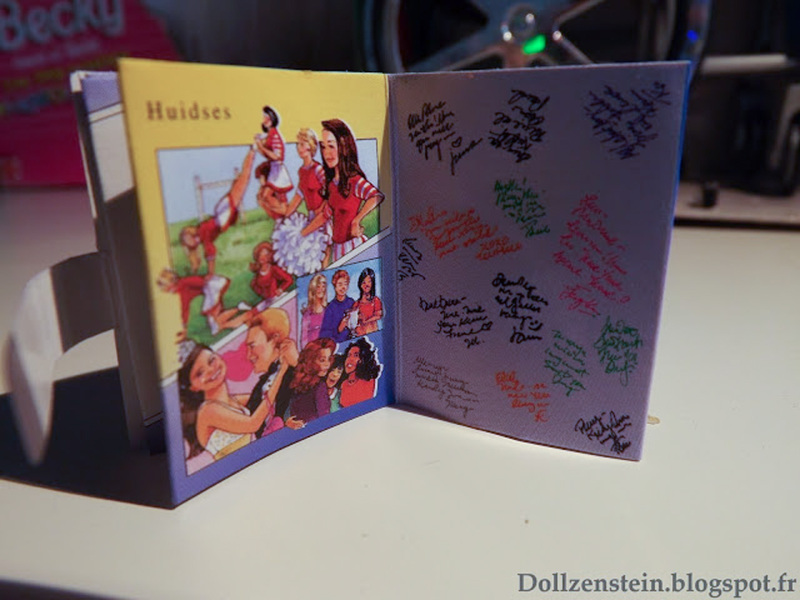 It's impressive that they actually tried to make it look like a real yearbook, but then didn't bother to make the names and autographs actual words - why? I was going to suggest the large mermaid tail on a Disney Animator doll or Fancy Nancy doll since they are all vinyl, and thicker in the waist (maybe too thick though). 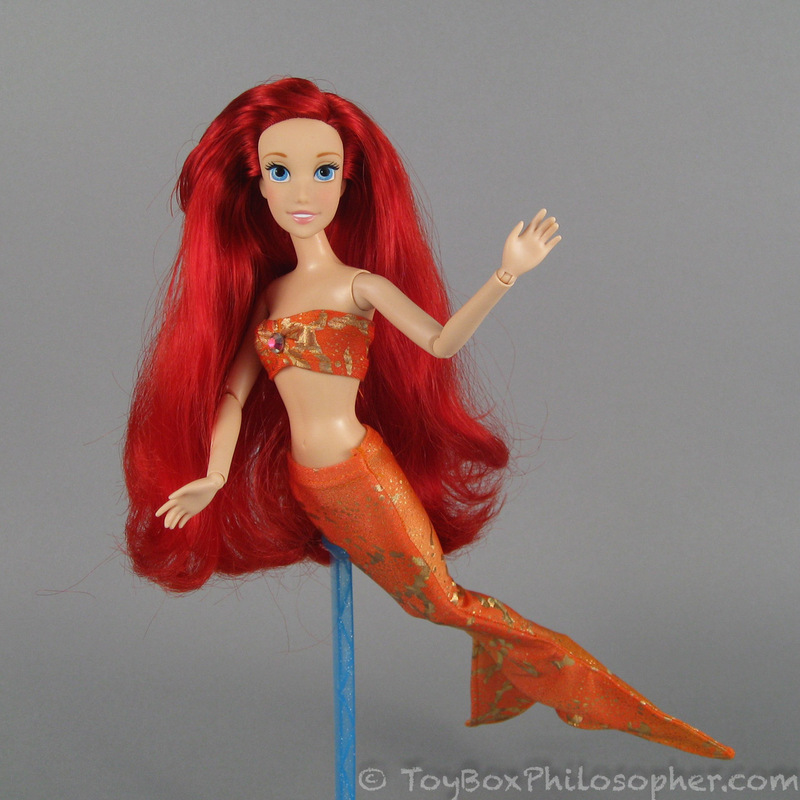 I think the small fins are a good solution for the poor naked Ariels I always find at the thrift store. They look great on the Liv doll, for sure. 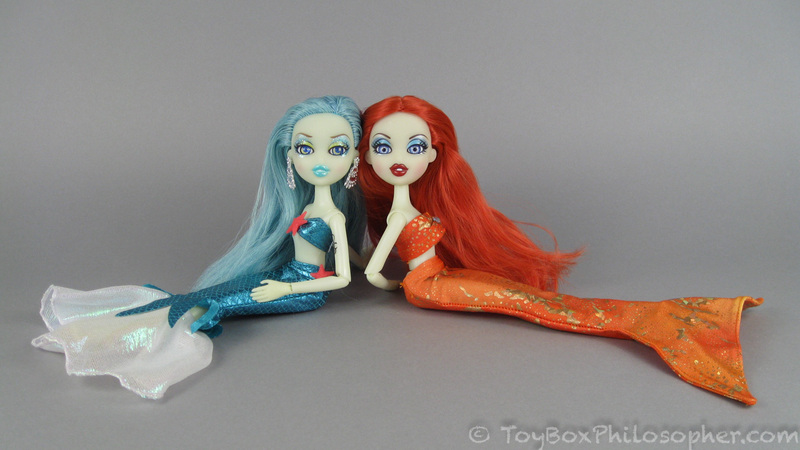 I was wondering do the mermaid outfits fit Ever After High dolls, or Monster High dolls. Great review. 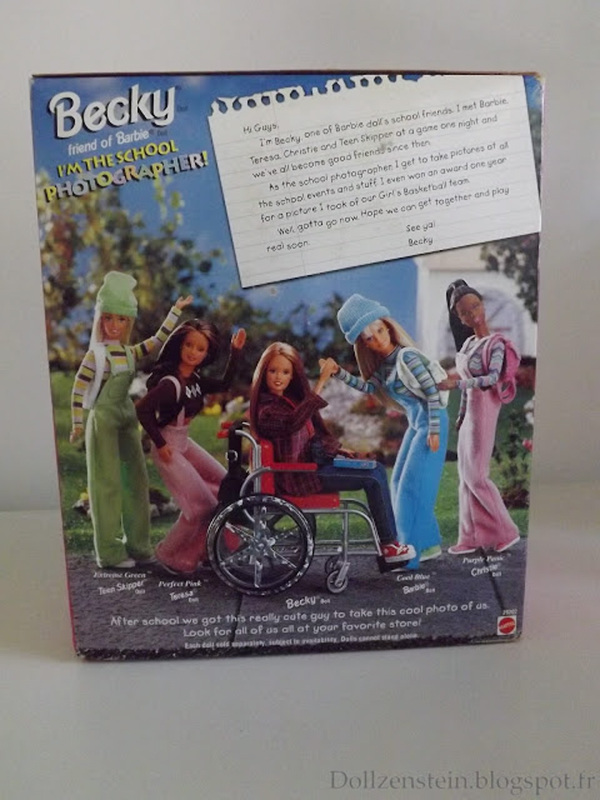 I hope they have a updated version of Becky sometime. 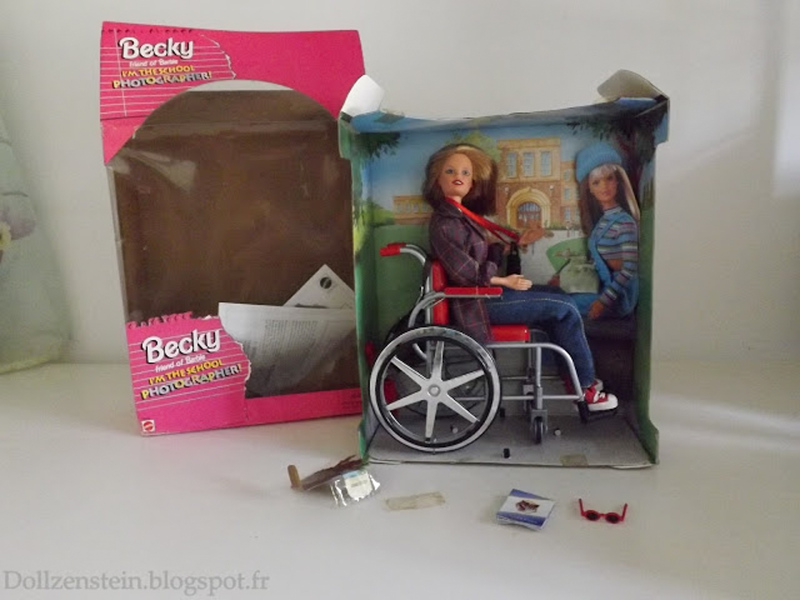 I have this same Becky and wheelchair I bought it when it came out! 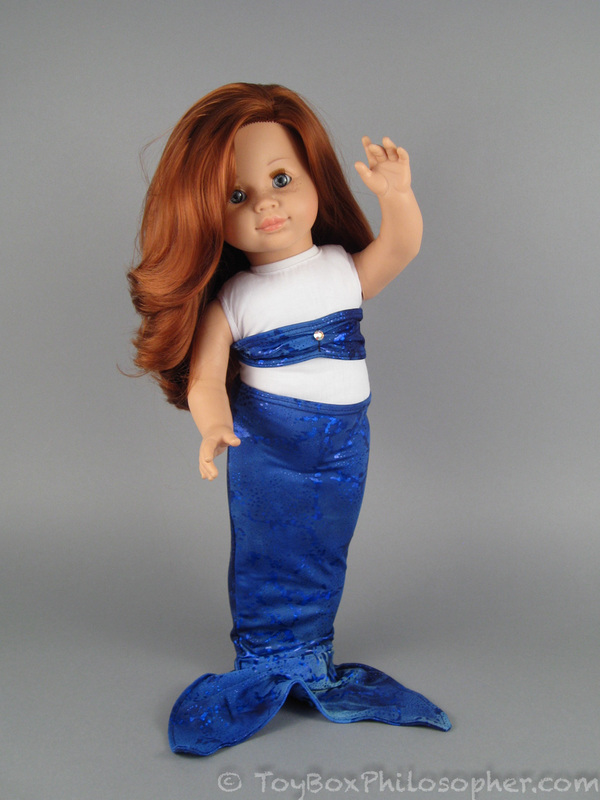 This isn't the first Becky doll. In the 80's, Becky was walking! I wonder why either her name was reused, or how she became paralyzed. The letter on the back of that box grates on me. "One of Barbie doll's school friends." "Teen Skipper." Just say "One of Barbie's friends," and nix the "teen." Google Translate detects no language for the yearbook. 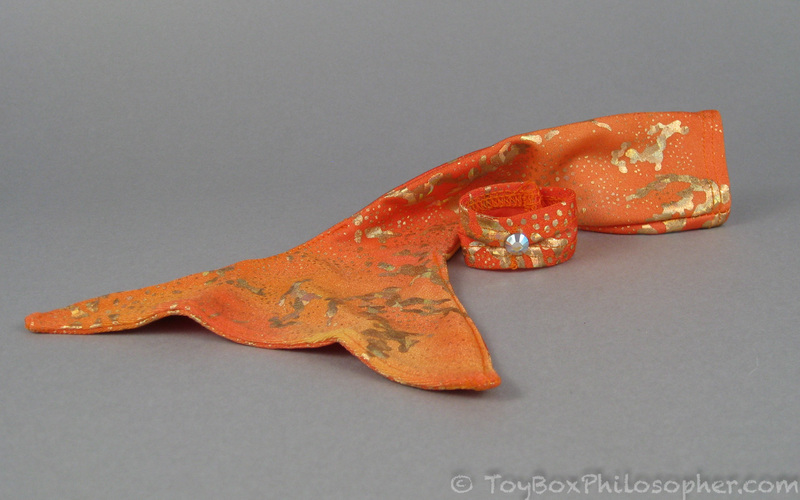 "In particular, what do you think of the $10 price for this kind of item? " If made in the US, great! If made in China, then the seamstress sewed what she was told to for $100 per month. I'm curious to see what Finn's story will be. 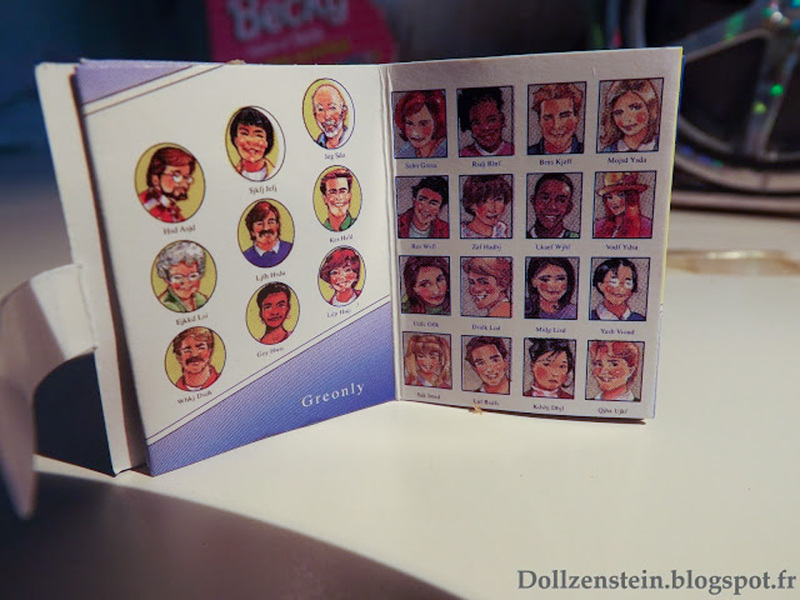 I don't if the name was just reused, but there is a tie in book called Three Cheers for Becky which suggests it was the result of a cheerleading accident. Great reviews! Thank you for the information and supportive photos. Do you have a Karito Kid or similar? The tail might look especially fantastic on them. The only issue might be height, but I think that in terms of torso size, they might work fairly well! I love the fact that they gave Becky an actual personality. 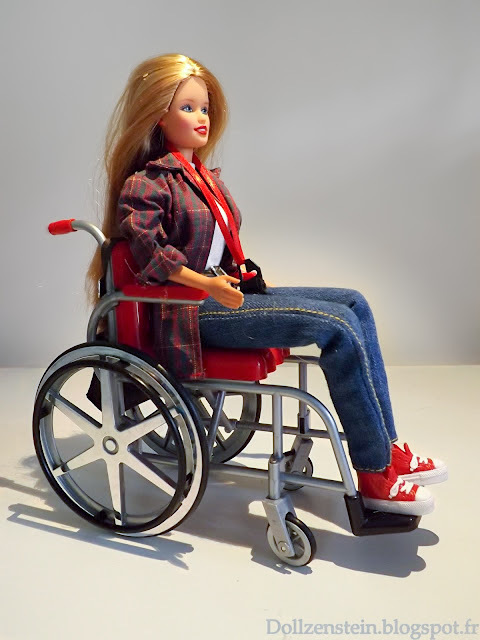 So many disabled dolls just have their only personality trait to be their particular disability, but instead Mattel didn't mention it at all. I think that's one of the best things about her.